Have you ever wonder why your child seemed to have understood and even memorised all the Science concepts but yet is not doing well for his/her Science tests and exams? That is because there is greater emphasis on process-skills based questions. Very often students get frustrated, confused and taken aback when they are confronted with questions they have never seen before. Most of our students still depend on the convention rote learning of facts. The Singapore’s Ministry of Education advocates that teachers provide opportunities for students to use concepts and integrate skills and processes to inquire things and phenomena around them. 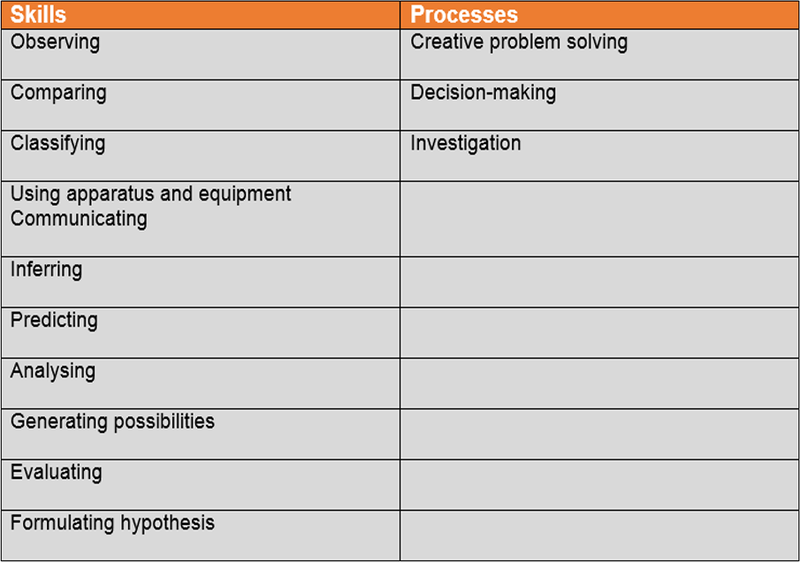 Students are expected to master 11 skills and 3 processes as shown in the table below. For this skill, students have to use their senses to gather information about objects or occurrence. This skill set tackle on identifying the similarities and differences between two objects, incidents, concepts and processes. This involves grouping objects or incidents based on their common features or characteristics. It also could involve ordering of events and objects or steps in experience. This involves the knowledge and skills in handing various apparatus and equipment. It focusses on how to select and handle the apparatus and equipment appropriately for various task and experiments. This involves transmitting and receiving information present in different format - verbals, tubular, graphical, pictorial, etc. It also includes sharing of ideas and explaining of information. This involves the interpreting or explaining of observations or pieces of data or processed information. Example is to draw conclusion from an observation, study or experiment. This is the ability to assess the likelihood or an outcome based on the observation and prior knowledge of the properties of the objects or incidents. This is the ability to identify the parts of objects, information or processes, and the patterns and its relationships between them. This is the ability to explore all the alternatives, possibilities and choices beyond the common known. This is the ability to access the rational, reasonableness, accuracy and quality of information, processes or ideas. It is also the ability to assess the quality and feasibility of objects. This is the ability to make general explanation for a related set of observations or events. It requires several tests to be able to come to a conclusion to prove the hypothesis. A hypothesis can be inconclusive even after several experiments have been carried out.